Without the use of a manufactured harness, many methods are still available for attaching oneself to a rope. Harnesses can be improvised using rope or webbing and knots. a. Swami Belt. The swami belt is a simple, belt-only harness created by wrapping rope or webbing around the waistline and securing the ends. One-inch webbing will provide more comfort. Although an effective swami belt can be assembled with a minimum of one wrap, at least two wraps are recommended for comfort, usually with approximately ten feet of material. The ends are secured with an appropriate knot. b. Bowline-on-a-Coil. Traditionally, the standard method for attaching oneself to the climbing rope was with a bowline-on-a-coil around the waist. The extra wraps distribute the force of a fall over a larger area of the torso than a single bowline would, and help prevent the rope from riding up over the rib cage and under the armpits. The knot must be tied snugly around the narrow part of the waist, just above the bony portions of the hips (pelvis). Avoid crossing the wraps by keeping them spread over the waist area. "Sucking in the gut" a bit when making the wraps will ensure a snug fit. (1) The bowline-on-a-coil can be used to tie-in to the end of the rope (Figure 6-19). The end man should have a minimum of four wraps around the waist before completing the knot. Figure 6-19. Tying-in with a bowline-on-a-coil. (2) The bowline-on-a-coil is a safe and effective method for attaching to the rope when the terrain is low-angled, WITHOUT THE POSSIBILITY OF A SEVERE FALL. When the terrain becomes steeper, a fall will generate more force on the climber and this will be felt through the coils of this type of attachment. A hard fall will cause the coils to ride up against the ribs. In a severe fall, any tie-in around the waist only could place a "shock load" on the climber's lower back. Even in a relatively short fall, if the climber ends up suspended in mid-air and unable to regain footing on the rock, the rope around the waist can easily cut off circulation and breathing in a relatively short time. (3) The climbing harness distributes the force of a fall over the entire pelvic region, like a parachute harness. Every climber should know how to tie some sort of improvised climbing harness from sling material. A safe, and comfortable, seat/chest combination harness can be tied from one-inch tubular nylon. c. Improvised Seat Harness. A seat harness can be tied from a length of webbing approximately 25 feet long (Figure 6-20, page 6-30). (1) Locate the center of the rope. Off to one side, tie two fixed loops approximately 6 inches apart (overhand loops). Adjust the size of the loops so they fit snugly around the thigh. The loops are tied into the sling "off center" so the remaining ends are different lengths. The short end should be approximately 4 feet long (4 to 5 feet for larger individuals). (2) Slip the leg loops over the feet and up to the crotch, with the knots to the front. Make one complete wrap around the waist with the short end, wrapping to the outside, and hold it in place on the hip. Keep the webbing flat and free of twists when wrapping. (3) Make two to three wraps around the waist with the long end in the opposite direction (wrapping to the outside), binding down on the short end to hold it in place. Grasping both ends, adjust the waist wraps to a snug fit. Connect the ends with the appropriate knot between the front and one side so you will be able to see what you are doing. d. Improvised Chest Harness. The chest harness can be tied from rope or webbing, but remember that with webbing, wider is better and will be more comfortable when you load this harness. Remember as you tie this harness that the remaining ends will need to be secured so choose the best length. Approximately 6 to 10 feet usually works. (1) Tie the ends of the webbing together with the appropriate knot, making a sling 3 to 4 feet long. (2) Put a single twist into the sling, forming two loops. (3) Place an arm through each loop formed by the twist, just as you would put on a jacket, and drape the sling over the shoulders. The twist, or cross, in the sling should be in the middle of the back. (4) Join the two loops at the chest with a carabiner. The water knot should be set off to either side for easy inspection (if a pack is to be worn, the knot will be uncomfortable if it gets between the body and the pack). The chest harness should fit just loose enough to allow necessary clothing and not to restrict breathing or circulation. Adjust the size of the sling if necessary. e. Improvised Full-Body Harness. Full-body harnesses incorporate a chest and seat harness into one assembly. 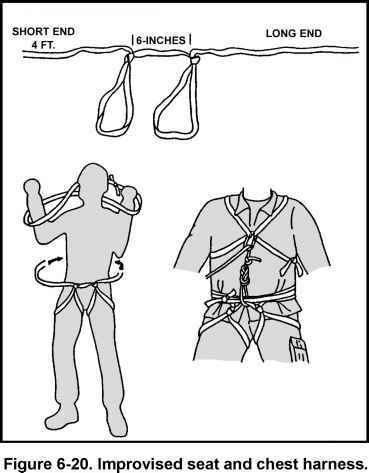 (1) The full-body harness is the safest harness because it relocates the tie-in point higher, at the chest, reducing the chance of an inverted hanging position on the rope. This is especially helpful when moving on ropes with heavy packs. A full-body harness affects the body position only when hanging on the rope. How to tie a bowline on a coil harness? How to tie a improvised chest harness? How to tie a chest harness with sling climbing? How tie a climbing harness webbing? How to tie webbing chest harness? How to tie an improvised climbing harness? How to tie rope tree harness? How to tie rope climbing harness? How to make a climbing sling seat? How to tie an improvised full body harness for a child? 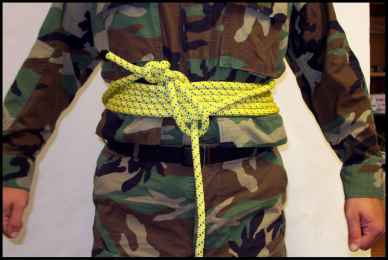 How to tie a swami belt? How to tie swami belt waist only? How to tie a chest rock climbing harness? How to make a bowline harness? How to make a glacier travel harness from webbing? How to climbing sling from webbing "buy aciphex"? How tie body with webbing belt? How to tie a rope full body cage? How to tie a full body harness made of webbing?